I was playing with some different bread dough last week that led me down an English lane – metaphorically speaking, that is. The almond flour I added to my dough had produced a loaf that was dark on the outside, light on the inside, and with a nuttiness that put me in mind of the green fields and hazy hedgerows of rural England. In fact, remade into 4-ounce loaves, the dough turned out rolls that were very like the brown baps on offer in village bakeries around Britain. They’ve been called ‘baps’ in Britain for 450 years, but nobody remembers why. These flattened loaves, about the size of a Kaiser roll – often come sliced and filled with cheese and cucumber, or with a single layer of lunch meat and a piece of lettuce. 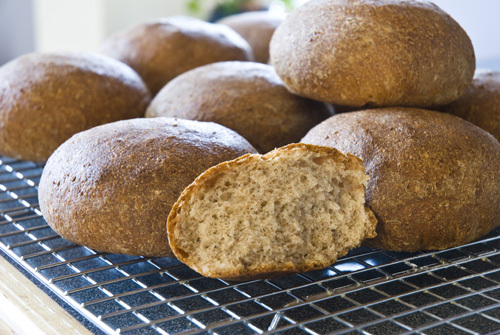 Wheatmeal versions are called ‘brown baps,’ and feature a dense crust, not at all crisp, that releases smoky richness as your teeth sink in. “Wot? Ye mean burger baps?” The bloke from Wembly asks me in an accent like the gecko’s in the insurance ads. Though I don’t remember hamburgers in the renaissance, I describe their unusual crust, the nuttiness, and the medium density inside. His eyes get wide. “Oh yeah,” he says. “They’re just like that.” And he shakes his head and smiles. “You know, people just don’t believe it. Bread is totally different in the U.K. Totally different.” Coming from a bloke from Wembley, these are strong sentiments indeed. So listen to the man and give these unusual sandwich rolls a go. Bite into one of these baps and imagine it coming from a bakery in a half-timbered shop in merry old England as it has for all these many years. You too just might agree that bread really is different in Britain! 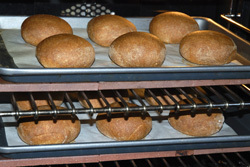 Make the dough: Measure the dry ingredients into a large bread bowl (an 11” diameter Mason Cash no. 9 from England is perfect) and mix with the handle of a wooden spoon. Make a well in the center and pour in the water. Using the wooden spoon handle, gather the flour into the water, stirring and plunging with the stick to incorporate the dry with the wet. Gather into a ball, scraping the bowl and spoon handle as necessary. Knead and let rise: Turn the dough out onto a lightly-floured board or counter, and spread it flat with your fingers. Fold the dough in half and spread it out again, then fold it in thirds like an envelope, and fold that in half away from you. You will feel the gluten in the dough begin to stiffen. Knead for a minimum of 5 minutes, and then put the dough into the bowl. First rise: Cover bowl and let rise in an 80º environment for 2½ hours. Second rise: Punch down dough, turn it in the bowl, cover and let rise 1½ hours. Shaping the baps and third rise: Turn dough out onto the counter and roll with your hands to form a fat snake of dough about 2 feet long. Cut dough snake into 12 equal portions (use a scale for uniformity, if desired) and turn each piece in on itself to form a mounded ball with a smooth skin. Let rest for 5 minutes before final shaping. Pull the outer skin (gluten cloak) lightly to make the top of each bap smoother, tucking the excess into the bottom. 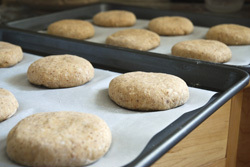 Gently pat each ball of dough to flatten it to about an inch thick and place it on the parchment paper. Covered the trays of baps with cloth and let rise for 45 minutes. 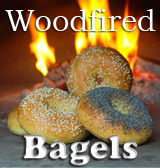 Preheat oven: These are best baked in a convection oven fitted with quarry tiles or pizza stones on two racks. For non-convection ovens, bake one tray at a time using tiles or pizza stone for best results. Preheat oven to 425º for at least 30 minutes. Bake the baps: Brush the tops of the baps twice with water. Bake both trays at the same time if possible, running the convection fan for all but the last 5 minutes. Bake at 425º for 10 minutes. Switch racks and turn pans around, lower the oven temperature to 350º and bake for a further 15 minutes. 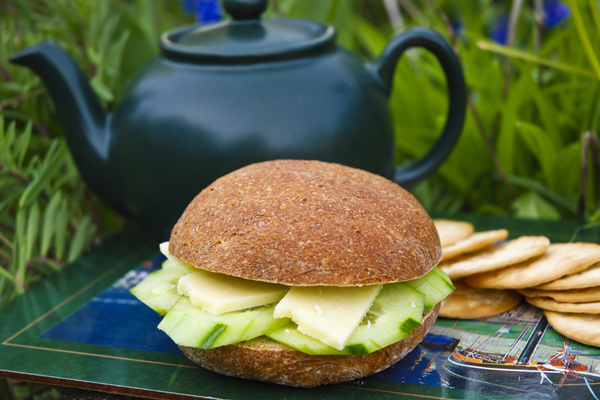 Let baps cool for 30 minutes on a rack, and then break out the English cucumber and some English farmhouse cheddar to enjoy an age old treat! Delizioso! Filling them with arugula, roasted red peppers, provolone and playing with meat ideas. Perfect idea for a sunny breakfast in veranta! I love the shape of these buns and appreciate even more that they are made of whole-wheat flour. Gorgeous baps! 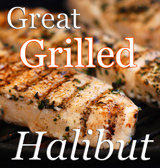 I love that name, and I am intrigued by the almond flour in this recipe. I’ll definitely give it a go. Question…Do you have a good recipe for a cheese bread? Those look amazing! You should enter the teapot/cucumber picture to http://www.tastespotting.com or http://www.foodgawker.com – do you know those sites?